We price each job individually, and this price is based on distance, length of hire, time of day and all sorts of other things. Without knowing all the details of a particular job, we can’t give a definite price, but what we can do is give you an estimate based on the information you give us. Bear in mind though, the more information you give us, the more accurate the estimate will be. Don’t forget, that we still have to charge if Olive is waiting, for example during a wedding ceremony. The hire of the bus is not subject to VAT, but if you choose any of the extras that we offer, then we have to charge VAT on those prices. Bear in mind that the prices shown on the Booking Form are shown exclusive of VAT. 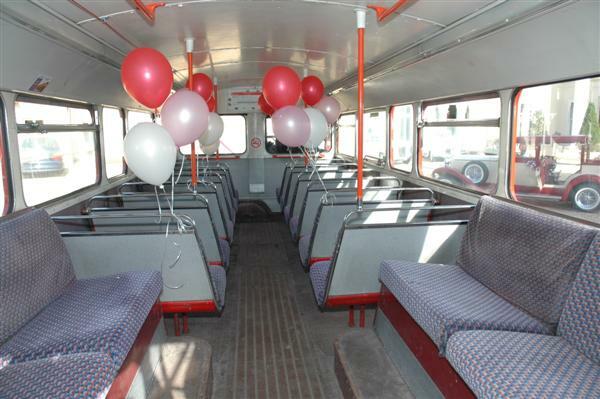 If you are booking the bus, but aren’t going to be on it perhaps because you are a bride or groom, then we would ask you to nominate a party leader on the bus. This will be the person that we liaise with on the day, to ensure everything runs smoothly, and someone for us to contact if there are any traffic or other problems, so we will need a mobile number for the day, for party leader as well. Best to ensure the party leader has our number too. There are a number of extras that we can offer, but the one thing we cannot provide is alcohol, as we do not hold a license. Please contact us if you would like to discuss providing your own alcohol for a function. We prefer to supply any flutes or tumblers used as we have to use plastic for safety reasons. We can decorate Olive with ribbons on the front and wrapped around the poles inside. We can also provide helium filled balloons in colours to complement your function. If there is anything else that you want, ask us we will try our best meet your requirements. 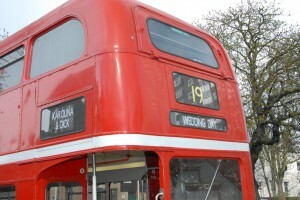 People ask what the destination blinds are, well they are the little windows on the front, side and back of the bus that show the bus number and where it is going. 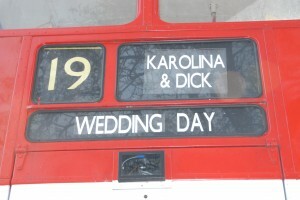 We can personalise one of the panels on the front and on the side of the bus. If you don’t want these personalised, then we will put standard blinds in at no charge. 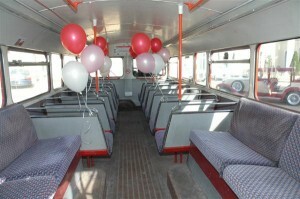 The bus has a total occupancy of 72 guests, including children. However, routemasters were not designed with storage space, so there is nowhere to put coats, bags, pushchairs etc. Therefore, we usually ask that three seats behind the driver are kept free for storage. Please also bear this in mind if you have soft drinks or take advantage of the cool box or ice bucket, these will need to be stored somewhere on board. 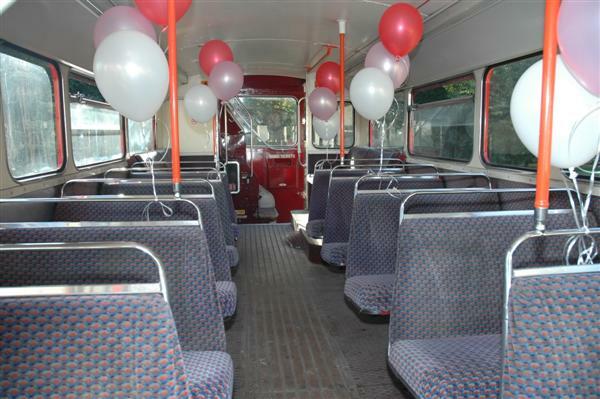 The bus is equiped with a sound system that can play CDs and radio, or we can plug in your own MP3 player if you want your own playlist for your guests. There are two sockets on the lower deck and one on the upper deck for a microphone if you want to make announcements to your guests or if you want to try your skills at tour guiding. Although the microphone cannot be used with music at the same time. There will be a conductor on board who will remain on the footplate. Please bear in mind the conductor is there primarily for safety, so I’m afraid that he or she cannot help with serving nibbles, making announcements or helping children. We are asked quite frequently if guests can smoke off the back of the bus. Unfortunately, the bus is still public transport and so it would be illegal to smoke on it, so the conductor will decline any requests to smoke. With all the high spirits on the bus, quite often people like to move around, especially children. 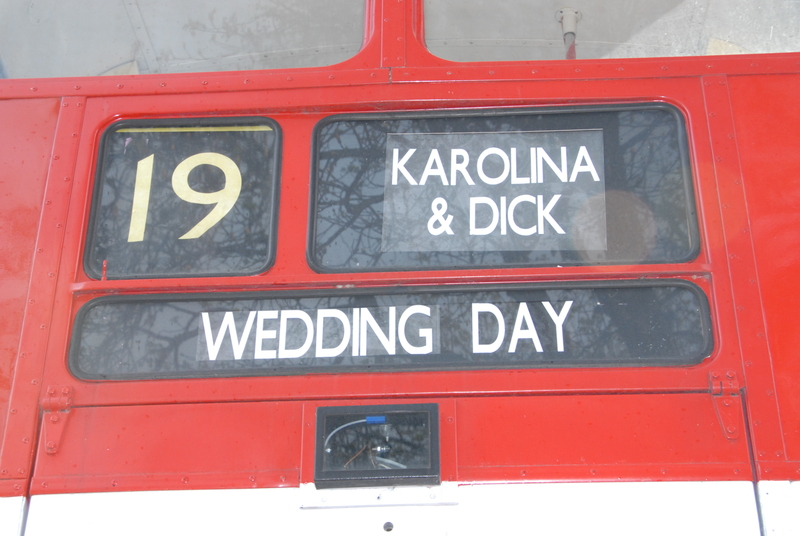 This can be so dangerous if the bus has to brake or turn. So, for your own safety it is very important that children stay seated and are looked after by a parent and guardian. This cannot be left to the conductor as they are not qualified child minders, and also this would detract from their other responsibilities on the bus. Olive is 14’6” high, 8’ wide and 30’ long, need we say more! This means she cannot go through width restrictions nor under lower bridges. Should there be any weight restrictions for bridges, Olive weighs 7.5 tons. Routes have to take all of these into account. On top of this, we have to remember that Olive is a classic vehicle and therefore is not that speedy. She has a top speed of 40mph, but prefers 30mph, and doesn’t really like hills, so this should also be taken into consideration when planning routes and allowing time. 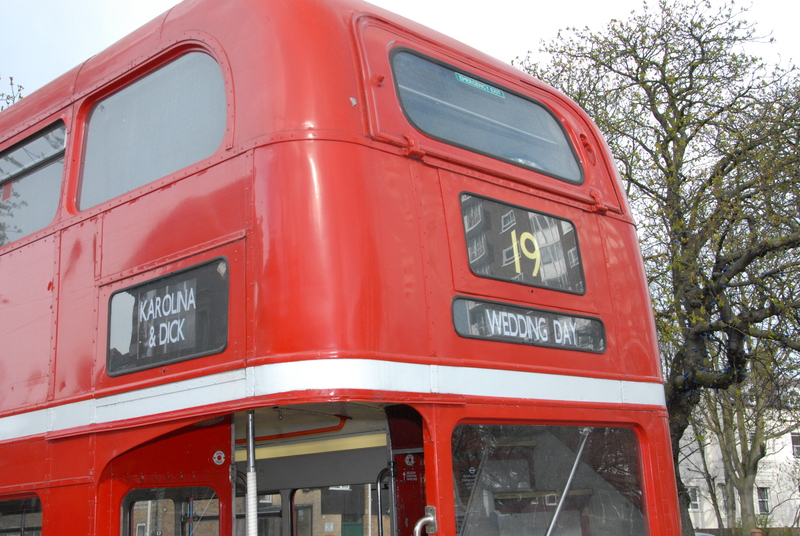 Olive is exempt from congestion charge and is authorised to use the bus lanes which can help with journeys in London. However, she is still bound by other restrictions such as red routes, double yellow lines and single yellow lines. This should be taken into consideration when thinking about pick up and drop off points, and where Olive should park and wait if necessary.